Tuesday 16th March was the day that around 19 children came to school more nervous and excited than usual, as today was the day they were due to represent not just Meath Green, but the whole South East Surrey area, in the Surrey County Schools Athletics Finals, having won that right by a comprehensive victory over 15 other local schools at Donyngs the previous month. 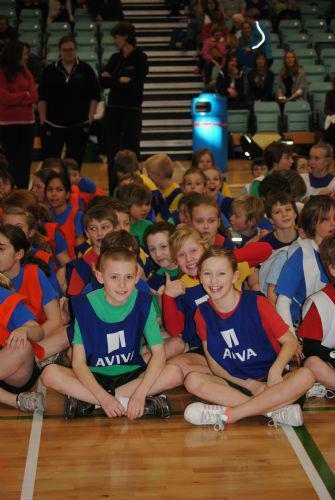 Their nerves were not helped when they walked proudly into the large arena at the Spectrum Centre in Guildford, to see huge numbers of children from schools all-over the County, busy warming up for the events of the day. Looking around they were comforted when they spotted lots of parents, relatives and friends amongst the spectators, all cheering and encouraging them on. As race followed race, all denoted by the firing of the starter's pistol, this support never tired and by the end of the day, after many excellent performances against some very tough opposition, the team managed a very creditable 7th place. Rightfully proud of their efforts the pupils returned to Meath Green still happy and excited by the whole experience. Congratulations to all who took part and thanks to Miss Fremault, Mrs Ledwich and other staff who helped the team achieve so much.